Entertainment journalist Ashlan Gorse made a name for herself reporting on Hollywood trends and interviewing celebs for E! 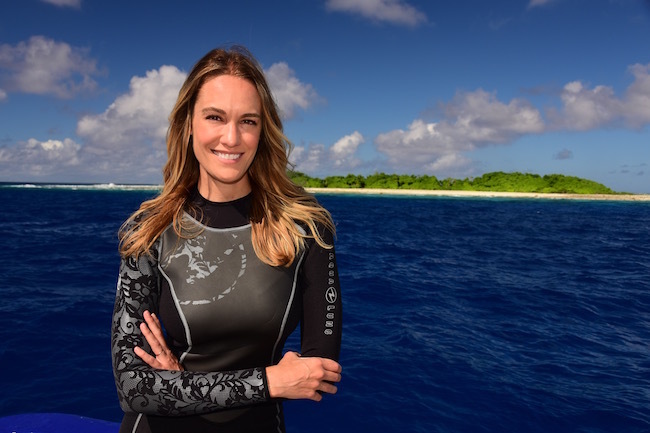 News, before she attended the party where she met Philippe Cousteau Jr., now her husband. 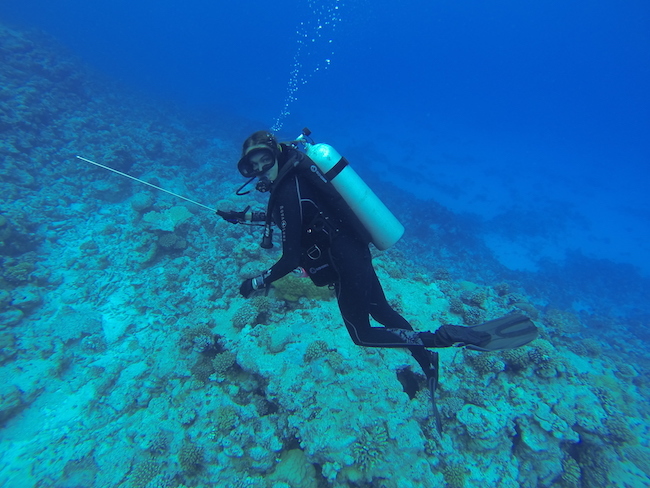 Cousteau took Gorse to Bonaire to get scuba certified, and, since then, the pair has been diving happily ever after. Do you have a favorite wetsuit? I have two that I love. The W2 7mm by Waterproof is my cold water suit. It moves well for a thick suit, and has a front neck zip that is really helpful when I get too hot or too claustrophobic from the neck tightness. And the design is really cool—I feel like a superhero. For warm water, I wear Aqua Lung’s HydroFlex 1mm. It took me forever to find a lightweight but great-fitting long wetsuit. This one is perfect for multiple warm-water dives, or when there may be things in the water that sting (fire coral is not my friend!). I have a naturally powerful kick as I’m almost 6 feet tall. When diving for fun, I use short travel fins from Cressi (a model they don’t make anymore) that are easy to pack. 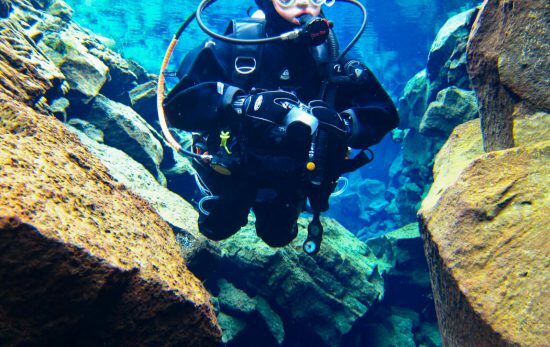 For more technical dives and shark dives, I use the Agua Lung X-shot in all black. They are thin, sturdy and propel with little effort. 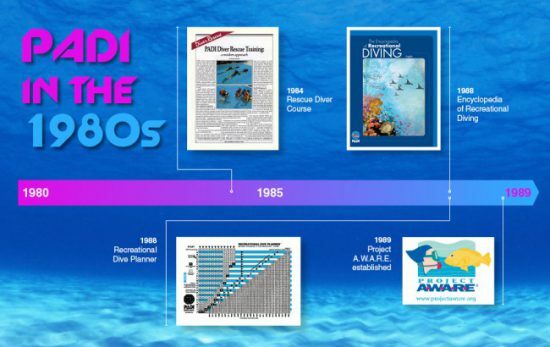 Which dive computer do you use? I just recently got the Oceanic VTX dive computer with transmitter. It’s amazing! The full-color screen is easy to see, even at 100 feet. For such a great computer, it’s low profile—important when you have small wrists. Just remember to have a bunch of spare batteries as color screens use a lot of power. 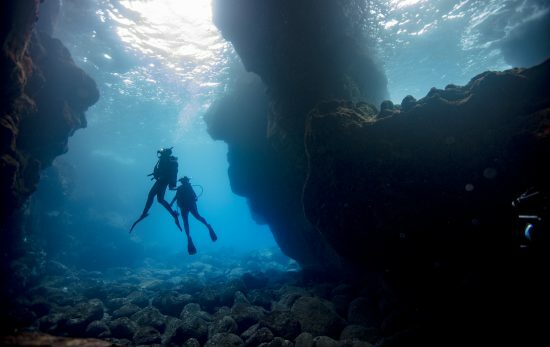 Do you have any other must-have items for diving? When Philippe first strapped a simple back plate (like his grandfather used) on me in the Caribbean, I was a little hesitant. Then I jumped in. The freedom was astounding. I truly felt like a fish. I love controlling my buoyancy with only my breath. I wanted to replicate that feeling on dives when a BC is needed for safety and found the Apeks Ultralight Travel Plate. I add the D18 Single Cylinder Wing when needed. It’s a great rig and I still feel streamlined and free. And my favorite mask is Aqua Lung’s Atlantis. 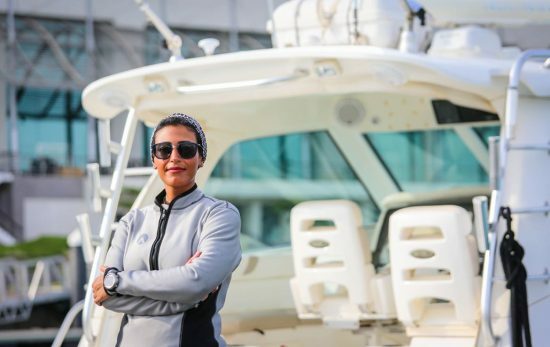 It has old-school Cousteau style! Do you bring a pointer or a slate to communicate with Philippe? We use slates occasionally for work dive if filming and have to coordinate a shot, but usually we just use metal bangers, welded of old fishing spears and about the length of a pen. Great to get each other’s attention, then we do good ol’ underwater charades. What about any special gear or tools? We have a special tool that opens fresh coconuts! Yum. Do you have an after-dive snack? I always have granola bars on hand because diving makes me really hungry. And if it’s my last dive of the day, there is always a Corona or glass of rose wine nearby. On our last trip to the Marshall Islands, we loaded up with everything: Cipro, Z-Pak, Tylenol, Tums, Pepto, Epi Pens — you name it. But that was because we were on a live-aboard with nothing but the Pacific Ocean around for weeks, and we were diving with sharks. Otherwise, I always have ginger chews, ginger pills, Sudafed (in case sinuses won’t clear) and alcohol to rid swimmer’s ear. Sunscreen is so important, but can be harmful to us and our water. I always use sunscreen based in non-nano Zinc and Titanium Dioxide. Other chemicals used in most sunscreens have been linked to causing cancer in humans and can be deadly toxic to coral. For body, I use Goddess Garden Organics Sunny Kids Natural Sunscreen Spray SPF 30. It goes on clear and dries quickly. For face, I use La Roche-Posay Anthelios Mineral Ultra Light Sunscreen SPF 50. I use the tinted formula. It spreads easily and doesn’t run in eyes. Don’t be scared guys — Philippe likes it, too. Are there any other beauty products you pack on dive trips? Saltwater wreaks havoc on my hair and skin, so I bring an organic oil. You can put it straight in your hair and on skin. One of my faves is Josie Maran 100% Pure Argan oil. I slather it everywhere after a dive. How do you usually fill your surface interval time? To be honest, Philippe and I usually just sit and talk about all the amazing things we just saw. 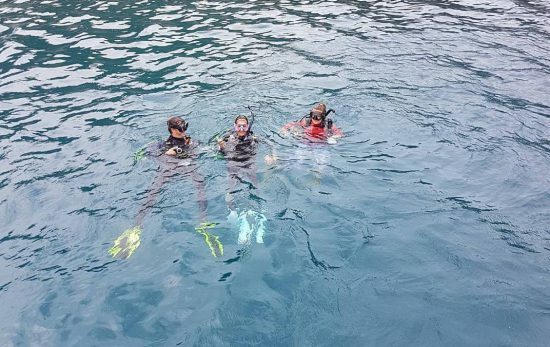 What I love most about diving is that it is something you share with friends or a loved one. What items do you never leave home without? 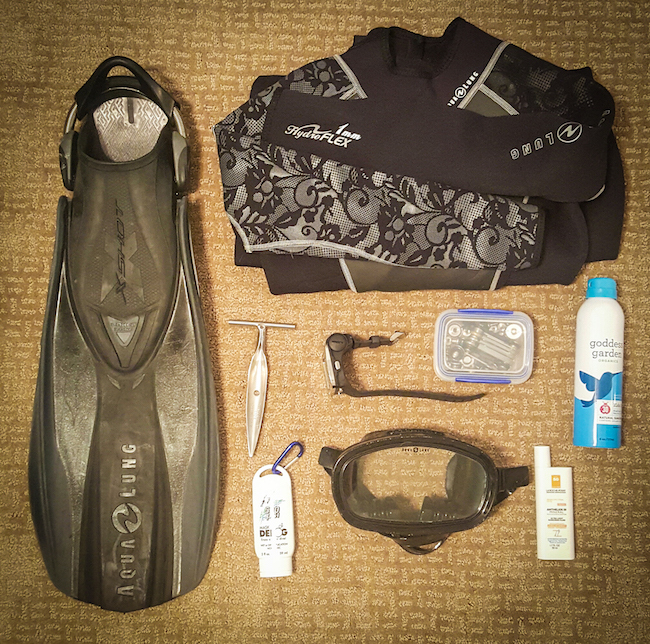 Let us know what essentials you keep in your dive bag and stay tuned to take a look into other diver’s dive bags as part of our What’s in My Dive Bag series.